A simple leather bound pocket book tied closed with a long woven strip of spidersilk. It looks rather simple. But casting it won't be--neither simple or easy. Anyway, past experience has taught me caution. I think it's best to try a smaller version first. Maybe a third of the size of the adventurer-shooting cannon we hope to replace. But--that's something to talk to others about. *a large arrow is drawn pointing to this last sentence*. 1. Measuring sticks. Our ability to measure exactly is Very Important! 4. enough sand and clay mixture to fill the boxes. 6. a) Rod to create the fire hole. 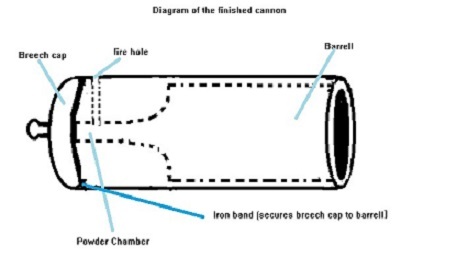 b) Iron band to secure the breech cap to the cannon barrel. 7. Trunk from a very solid tree whittled into a cylinder the diameter we want the cannon to be. 8. Two braces to steady the pattern that will form the inside of the barrel. 10. lots of scrap metal. So~~~~~How did the ancients make those cannon? From my researches, I've managed to piece together some ideas about how they might have done it. The most likely way was that they cast the barrel and then bore out the center with their amazing tools and magics that I can't imagine doing it now, since I can't remember ever noticing the seams on the cannon before they were destroyed in the battle against the Dark Lord's fortress (May no power even half as terrible ever threaten our world again!). So, anyway, the cannon itself would be cast in three parts: The two halves of the barrel, and the chamber. Then I'm thinking the bands--or hoops--would be stronger if they were wrought rather than cast. I've only cast a few small pieces of jewelry, so I'll have to talk with Aryana and Bris about how they cast the cannon balls for the attack. I'm thinking the sand would have to be strengthened for such heavy casting. Would the mud from the rainforest be enough? Or would we have to find something more like clay? Well, I think my researches are almost done. I'm eager to begin the experiments! I went to visit poor delusional Floyyd the other turn. Maybe that empty space where his cannon used to be won't be empty for too awfully much longer. Many turns have passed since the defeat of Balthazar, and the emergence of the Bronze entity they call Drakon. I've thought long and deeply and I've determined that I'll not let myself be lured by mystery and promises of knowledge--and magnificent beauty. If any of our Gods or the Balance they spoke of is in danger from this Bronze--and it seems obvious that they are--then my decision is made. There are many more ways than one to gain knowledge, but why not begin with the most simple: just ask? I train. I visit Blaze the Flame serpent. And I visit the places where those were lost who will never return. I speak words like, "The Demon Lord is dead now. You are avenged. May you rest in peace." But the peace we had once dreamed of for the world has not come. Not really. I won't write of that. I'm consumed by wonder of this mysterious God. There are so many questions crowding my mind, tormenting me. Bronze glowing veins in the living rock beneath Branishor. Mysteriously Bronzed objects held by the few, gone now...doors opened to strange sights. Fascinating tales told of words caught in static haze. magic. mystery. and. . . . . magnificence. Other adventurers seem so casual about it all. "Yes," they tell me, "the Gods are perfect, what --you mean you've never seen one? Only heard them speak from above? Well, they are gods, after all"
I'm wrong to be irritated by this. We are humans and we ought rightfully to concern ourselves with human affairs. It's over. What's done is done. Yesterturn's menu for Blaze the Flame Serpent included Pirate grub and Pirate ale. I listened closely in hopes of hearing a bit of an "Arrrrr!" from him, but Blaze was silent as usual. This morning I brought him a meat pie and a mug of MSG. Ah! The MSG disappeared very quickly! It took a half-marc longer for him to consume the meat pie. This is an encouraging event. We are still awaiting announcement of another meeting before the advance. I pray that is is scheduled soon. Very soon. I brought Blaze the Flame Serpent mead and a Dundee burger last turn. And huge Rat claws and another ale this turn. It's strange how I never seem to actually see him eat or drink anything I set out for him, no matter how closely I watch. In the blink of an eye--or the turn of a marc--, it's gone. I think often of the ancient enchanter's city of Ryn. How wondrous it must have been to live during there during the Golden Age! Offered Blaze the F.S. ale and sewer rat stew at dawn this turn. Due to the darkness in that corner of N'rolave Milltown,I did not witness him actually eating and drinking it, but I believe he did. Dusk the same turn: lemonade and fresh fish from Kilican. I won the shield of the Scarab King last turn, thanks to powerful enchanters and clerics who covered me with their blessings and spells. Now to grow strong enough to lift it! Well, I couldn't have been more wrong. And I couldn't be happier to be. It's so exciting when experiments yield unexpected results! Though I don't quite see how such results might help us in our mission, any new advance in knowledge is valuable to us all, I think. I've been very conflicted these past several turns. I hope and believe that I've done the right thing. I spoke of my--concerns--about experimenting with exploding bags of magic teleporting powder (MTP) to a member of the Iron Order. While he had some insightful comments, he didn't seem to think that the risk of the damage to the Nexus and anyone inside need prevent experiments. Of course, only three others know the actual basis of my "concerns". The Iron Order has sent out a summary of the meetings and have requested that certain suggestions be carried out and their results reported. This includes Falx's suggestion that we begin experiments. I spoke with him again and Falx has agreed that we ought to discuss the risks with other adventurers--especially other enchanters. I was assigned to arrange experiments with exploding mugs of ale, and other beverages. However, the efforts at the failed defense of the Dundee castle could be called battle experiments, and I'll suggest to the adventurers who actually did them that they report the results to the Iron Order. I see no reason to continue any beverage-exploding experiments. After seeing how little effect they had on the portcullis, is seems there's even less chance beverage explosions would be capable of breaching the walls of the Dark Fortress. Not that I have any confidence in my own reasoning anymore. "Overconfidence," a wise enchanter once said, "is the Enchanter's malady." After nearly half a turn spent scrubbing burn- and scorch-marks from the walls and floor of the arrival area in the Nexus, I have decided this would be a good time to put an end to any experiments involving exploding bags of magic powder. I am so grateful that no one was harmed by my foolishness. Ah! What was I thinking? Magic dust teleports enchanters to the nexus, and only to the nexus. We were already inside the nexus when someone thought to hit that first bag of magic powder with a fire ball. That's why the explosion remained in the nexus--of course! But the experiments I conducted on the beach--oh, all my careful safety precautions!--each of the three blasts of magic must have activated the magic dust, teleporting a large part of the explosions into the nexus! I shall never cease to thank the Gods that no one was harmed. I am appalled and horrified at the thought of what might have happened. I shall not tempt fate so again. I must cancel any plans to continue such experiments, obviously. And tell those who offered to join me in them. Oh, how could I have been so thoughtless?! Ashani...We shall find another way to avenge you. First, I attempted--with appropriate safety controls in place--to ignite three bags of powder using blasts from each elemental staff: Ice, Fire, and Lightning. I conducted these experiments on the beach south of Dundee. I placed each MTP on top of a sand dune and stood upwind in a mild breeze that would take any smoke out to sea. Ice: I had expected that the impact of the piercing ice-shards would burst the MTP apart in a great cloud of dust without igniting it. This did not happen: The bag actually exploded! Possible explanation: intrinsic magic within the ice-blasts--or within the ice itself?--reacts with the magic powder, causing it to explode. As the breeze carried the residue off to sea, I thought I saw it glittering in 'rifter-light. A magical explosion that created no heat, perhaps? Several glittering bits fell to the sand. They were very small bits of the bag that had contained the magic powder. Fire: Like the description of the MTP explosion in the Nexus: When the staff fire-ball struck the MTP, it exploded in a large ball of fire. Just before the breeze carried the curling black smoke off to sea, I saw small bits of flame begin to fall to the sand. Upon examination, I found a few ashes caught in sand ridges. I believe they, too, were burnt remnants of the bag that had contained the magic powder. Lightning: The MTP disappeared in a sudden ZAP! of blinding white-hot light. I was forced to cover my eyes, but when I lowered my hands I could see no smoke at all drifting off to sea. Also, I couldn't find any bits or ashes that might have been the bag that had contained the magic powder. Further experiments may include using different containers for the Magic Powder, to try to gauge how they might effect the power and range of the explosions. About a deadly accident--an experiment gone wrong. That it would bring about the doom of our excellent Ashani. To strengthen future efforts against the fell Dark Lord. Enchanters choked and strangled amidst it's deadly fumes. "Try Light!" one called, and another: "Or ice! Or flame!" And so that noobie wasn't there when our dear Ashani died. A bag of magic powder, it was, set beside the door. A ball of fire cast upon it--a sudden, explosive roar! What magic caused the backdraft into the southern room? A mysterious force, it was, that brought Ashani's doom. So all you brave enchanters, come listen to my song. If you would cast experiments, I'd have you not go wrong. Lest fate decides it's time you share Ashani's doom. I have studied my notes of the events in the Nexus preceding the discovery of--no, I will take care not to name such things. I have heard tales of Adventurers being abducted by the evil one and I will not take the slightest risk of giving him dangerous information. I have many questions for several different people that have occurred to me. Dimitri Petrov....Bebhinn MacAirem...Cody Fireblade...Zane Ziegfried. My search for gold spells may suffer, but my curiosity is too strong. I must seek them out. Also, I still hope to begin the very first experiments that I hope may lead to the MTP that--once it's perfected--I hope to name "Ashani's Revenge"
Recent events indicate there may be a need for more research and experimentation. Just my cup of ... mead. I have had little chance to compile my notes into an entry. Now it seems important that I make the time to do so. And to continue experiments. Comparison of effects of fire and lightning staves' magic upon the sands of the Sandy Flats south of Dundee. with additional effects of levels of each staves with variants of my--the experimentor's--level of training. At my sponsor's advice I trained to level 18 before he took me to the desert temple to -- become an enchanter. I took my lightning staff I and a fire staff I to the Sandy Flats, not far from the great stone eastern wall. There, I pushed some sand into a small mound and, standing ten paces away, I shot a ball of fire into the mound. Upon examination, I found that the force of the fireball hit the mound, dissipating it. I noted several tiny smoking insects lying about and where the mound had been, the sand was warm to my hand . Next, I searched along the high cliff wall until a found a bowl-shaped portion of it's stone along the bottom edge. I poured more sand into it, and repeated the experiment. The sand remained in the bowl, and it was very hot--though not visibly so. I could feel the heat when I held my palm about a foot above it. Even at that distance, I had to remove my hand after a short count of three. I made a note of these results, and determined to repeat this experiment with the same Fire Staff I when I reached a level of training that was five levels higher. Then I repeated the first experiment with the mound of sand--and my lightning staff I.
Ah! I wonder why I was surprised. We used to go out to the beach of the Great North-eastern ocean after a thunderstorm and gather these. We called them sand-crystals. The lightning bolts fuse the grains together into the most beautiful patterns. I wonder, if the blast had more power to it, would the crystals be larger? More intricate? Or would they become glass? I look forward to the next experiment very much.